>>Audi has released 3 studio shot views of their R18 "LM" version, one of which affords me the opportunity to look a little closer at all those little ducts in the front fender region. As noted in the 4.27.15 update (below), 1 is the cooling feed for the LED lights that has been ever present on Audi LMPs for a number of years. We have some pretty purposeful looking ducts in 2 and 3 that seem to mimic a similar area of interest, though perhaps very different in execution, as on the sprint car. 4 is for uses as yet unknown, though perhaps related to 2 and 3, if I had to guess. With thanks to the Mulsanne Corner's nation, this image popped into the ole inbox this morning. The first thing to strike me is the area pointed out at 3. Clear, obvious, and coinciding with the size and location of the inlet shape on the front of the fender in the image above (3). 2 is less obvious and at this point in time could simply be a shadow, but there's a clear break in gradation at it's lower end which got me wondering. Again, could very much be a shadow, but like I said there has to be an outlet for the inlet on the front end (2) and options are limited. Having said that, I'm not 100% sure what I'm seeing at 1 either. It's just a limitation of the image. Looking at other images of the Audi's inner front fender and there typically is a clear split line at the arrow at 1 where the vertical cut of the BHH meets the curved surface of the inner fender. And that's all that could be. However, my imagination could also see duct #2 blowing air over the top of the front tire. 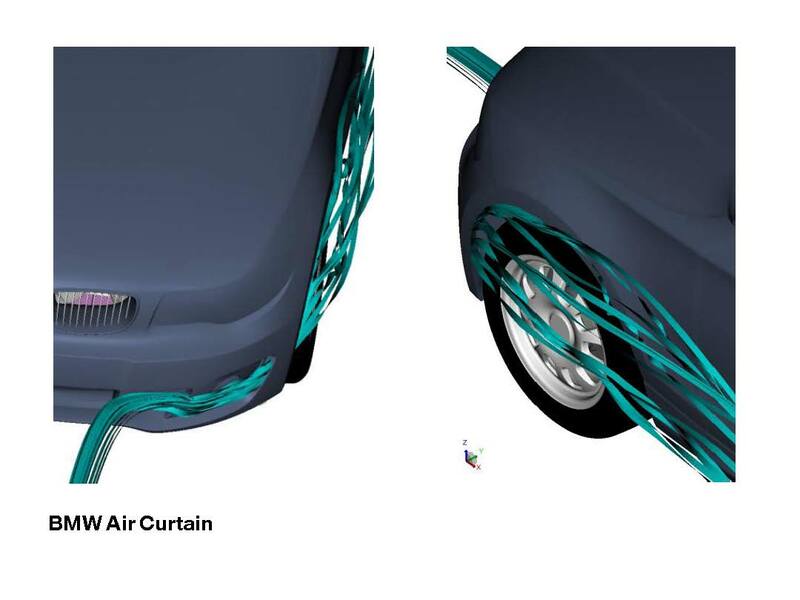 It might be useful, as after all the fender mounted BHHs have enacted a drag increase, and I can further imagine some motivation to mitigate it's negative effects. However, admittedly, it would be a difficult route to go from the face of the fender to below and then above the headlight to exit out ahead of the front tire. But then again, with the tall leading edge of the LM style front fender, there's lots of room available. The front fender/wheel well area has historically been a focus of attention on sports prototypes given the interaction between the spinning wheels and air flowing down the side of the car. And this is an area even road car manufacturers have been working in as a means to reduce drag, with the ultimate purpose being to increase fuel MPG. I still don't find any evidence of where exit 4 comes out/interacts. However, could it be a LM version of the huge nostril inlet on the sprint car? So therefore ducting an amount of air back to the front turning vanes? >>The LM version of the R18 features a number of changes over the sprint car debuted at Silverstone. I'm told to expect two examples of the LM car at Spa. Naturally the LM changes are directed at lower drag and downforce. Thanks to video and images shot by Stefano Bozzetti, we can have a look. Noticeable changes at the front are the much smaller front wing legality elements (1) and completely new front fenders (2). The Audi's wing shaped legality winglets revert back to being just that in lieu of needing less downforce on the nose, hence their much smaller size as compared to the sprint car's. The leading edge of the front fenders starts further forward and follows the trend of being very tall and seemingly overly wide/broad in plan view, following current low-drag trends regarding front fender shape. The R18-LM has retained the top located Big Honking Holes of the sprint car, whereas last year they went inboard at the front for Le Mans. Interestingly it also appears as though Audi was testing at least two different leading edge shapes for their BHHs. One leading edge shape directs air cleanly over the top of the fender while the other shape is lower (3) and allows air to flow into the top of the fender via the legality hole, similar to Oak Racing's interpretation as far back as Sebring 2012. Audi also tested with single (4) and double (image below) diveplanes. At the front of the R18 LM are four ducts on either side of the car outside the large obvious inlet that feeds the front wing, and the centerline intake that cools the hybrid componentry buried within the tub. On close inspection, one is the usual LED light cooling duct (1). The large duct (2) is notable and one wonders if it has a similar function as on the sprint car; in the case of the sprint car its function is to direct air to the turning vanes located at and behind the front wheels. However it's of note that the location on the LM variant is fundamentally different being shifted much more outboard and that it has a upper (2) and lower duct (3), with the lower portion being below the front dive planes. It's pretty clear these ducts directs air outboard, perhaps within the wheel well itself? Or could it work more as a truck vane (1, 2, 3, 4) and be more concerned with the wake coming off the leading edge of the front fender, or even controlling the wake being shed off the front tire? The last duct (4) is notable for its size and lack of obvious function. With such a small inlet area it's hard to imagine what its purpose is for now. The rear view mirrors are now mounted very low and integral to the trailing edge of the front fender (1). The vertical gurney that traditionally runs the length of the wheelbase (2) was on and off the car during testing (off in this image). The leading edge shape of the rear fender has changed. While the overall height of the fender is no different, the peak point is much higher and further rearwards (3). Looking at the rear wing endplate and it has a much smaller attachment point that is justified forward (4). And the rear brake intake has moved to ahead of the rear wheel (5), though admittedly I'm not sure where they are on the sprint car. Interestingly Audi has been testing wheel inserts aimed at lowering drag (6). We've seen similar in the past. These items were on and off the car during the test. Lots of changes at the rear too. The rear deck trailing edge height is to the minimum (50 mm) across the entire width now (1). And the trailing edge shape/area of the rear fenders is also different than the sprint car's. Looking at the rear end, the outboard face of the rear fender trailing edge is set inboard (2). The sprint car's outboard fender comes out all the way making the car slab sided, therefore the outboard shape on the LM car is completely different. Subsequently the inboard face of the rear fender has moved in closer to the car's centerline than on the sprint car, at least 50+ mm further inboard (3). The rear BHH are now on the inboard face of the rear fenders (4). >>Strakka were playing with their toy, their Dome S103 LMP2, at Imola today. It is a pretty striking car with very aggressive details. The crash box has been raised quite a bit and is attached to the lower wing element via minimalist mounts (1). Above the primary wing are legality covers that double up as wing elements (2). In front elevation they keep the suspension masked from view, and they have a particularly steep trailing edge. Oddly enough, there's a particular highlight at about 2/3 of its chord that suggests the concave contour isn't constant, that there's a crease and a camber change. The primary wing is also very steeply cambered at the trailing edge (1) as it too masks, in this case, the lower A-arm. You can also see another angle on the upper aero element and the crease (2). More details come to light looking from the rear. At the front we can see some of the shape of the front diffuser, a little whoopty-do ahead of the front tire (1). The mirrors are lowered to be below the top of the front fenders (2). The side pod undercut is pretty steep (3). And Dome has designed a legality bridge (4) that allows the trailing edge of the tub to dive away much sooner while still maintaining the regulatory minimum height. >>Nissan has made the strategic decision to withdraw from the pre-season test at Paul Ricard, as well as the first two WEC events at Silverstone and Spa, because of delays leading up to the tub's first crash test. However, the GT-R LM's monocoque did actually fail the crash test, the front roll over hoop didn't pass the push deflection test, and I have been told that the subsequent retest (next week), but more importantly the homologation completion (which has to be completed 30 days prior to a race, Article 2.7), means Silverstone (April 12) is completely out of the question as that would have required the homologation document to have been finalized last week. With Spa being on May 2, and the tub's re-crash test occurring next week, you can start to understand that even Spa begins to look very iffy, and so the decision was made to instead aim for a debut at Le Mans. Seemingly this all started when consultations with the ACO led to a redesign of how the KERS integrated with the monocoque. And understandably this redesign pushed the first crash test back substantially. The crash test failure ultimately is a non-issue and easily rectified, it simply comes at the wrong time. Just looking at the calendar and you can see that in order to make Silverstone everything really needed to be completed by around March 10, assuming first scrutineering for Silverstone being on April 9 or thereabouts. It was always going to be very tight to debut at Silverstone if everything went perfectly. I also understand the issue at Sebring was not related to the engine mounts, instead unnamed sources tell me that the KERS mounting was damaged, most likely because of Sebring's very rough nature, and the solution couldn't be rectified in the field. There is a solution at hand already, but small problem upon small problem, again the timing is not ideal. This is why you test at Sebring, in case anyone was wondering. Regarding that Sebring test, little has come out but I did notice an experimentation with larger diameter wheels on the fronts only (see image above), and this has subsequently been confirmed through sources that indeed 18" wheels were tested. And it sounds as though Nissan will be switching over to them from here on out, so 18" on the front and 16" still on the rear. And the purpose of testing is to naturally improve the car. So try this on for size, dated 1983, here's a scan of the original design brief driver Jonathan Palmer sent to Nigel Stroud following the initial shake down of Richard Lloyd Racing's Porsche 956.